Friday night in the Euroleague sees the Athens derby take place and this is shaping up to be a cracking match, which could be the highlight of the week. The hosts have a 10-5 record and they have triumphed in five of their last six games. However, Panathinaikos hold a 9-6 record and they won four games in a row before being halted by Unics Kazan in their most recent outing. It was always likely that this would be a tight affair such is the nature of the Athens derby but these two teams have similar records at this point of the season. 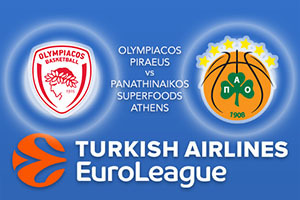 There is also the fact that Olympiacos grabbed a 77-79 win in the previous clash between these sides. That should be another indicator that there isn’t a lot between these sides, so it could be a tense and nervy affair in Athens on Friday night. Vassilis Spanoulis was in fantastic form in the previous Athens derby, grabbing 22 points and 8 assists. It was the final assist of the game, to Georgios Printezis, that set up the three point shot that turned defeat into a victory for Olympiacos in that match. Spanoulis has offered an average of 13.3 points per game this season while Printezis has notched an average of 12.2 points per game. Panathinaikos obviously want to avenge that narrow defeat but they will see this as a great chance to get back on track and move up the table. Nick Calathes is likely to be the player that makes a difference for the Supergreens as he has provided an average of 14.2 points per game, 5 rebounds per game and 6.8 assists per game so far this season. Chris Singleton has also been in fine form for the away team with an average of 11.9 points per game, while KC Rivers has notched an average of 10.5 points per game. This could go either way but take Olympiacos Piraeus at -4 at odds of 1.90. For the Over/Under market, go OVER 150.5 at odds of 1.90. Bet Now!